Bucatini [bukaˈtiːni], also known as perciatelli [pertʃaˈtɛlli], is a thick spaghetti-like pasta with a hole running through the center. The name comes from Italian: buco, meaning "hole", while bucato or its Neapolitan language variant perciato means "pierced". 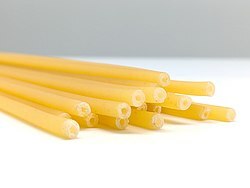 Similarly, ziti [ˈdziːti] are long hollow rods which are also smooth in texture and have square-cut edges; "cut ziti" are ziti cut into shorter tubes. There is also zitoni [dziˈtoːni], which is a wider version of ziti. Standard pasta machines will roll out sheets of flat pasta which are then cut into ribbons to make flat, ribbon-style pasta like fettuccine, tagliatelle, or pappardelle. Bucatini, on the other hand, has to be extruded rather than rolled. The pasta dough is fed into a machine that forces it through a perforated disk, very similar to a meat grinder. The shape of the pasta depends on the shape of the perforations. Bucatini is made with a disk with tiny circular perforations, which forces the pasta dough to emerge in long tubes. The tubes are then trimmed off to the desired length and then either dried or cooked fresh. ^ Giacomo Devoto, Gian Carlo Oli, Il Devoto-Oli. Vocabolario della lingua italiana, edited by Luca Serianni and Maurizio Trifone, Le Monnier. ^ "Perciare in italiano". Glosbe - Il dizionario multilingue on line. Retrieved 2015-11-16. ^ "Bucatini Pasta and How to Use It". TheSpruceEats. Retrieved 2018-08-24. ^ "Cook's Thesaurus: Pasta Tubes". Foodsubs.com. Retrieved 2013-02-21. ^ "Type Of Pasta". Thenibble.com. Retrieved 2013-02-21.